Sometimes a patch job can fix up a leaky roof but usually, a leak is a sign that the roof is either aged or has endured its fair share of severe storms. 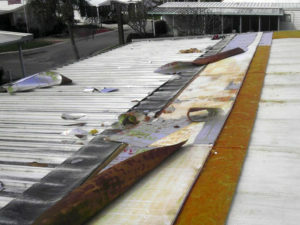 After so many Band-aid repairs and fix-ups, the roof will eventually need full replacement. Determining whether or not your roof needs to be completely made over is easy when you properly assess the condition of your roof. Yellowish-brown blotches on the ceiling are an indicator of a leaking roof. Weak spots in walls, or damp smells are telltale signs of damage and should be addressed sooner rather than later. Leaving leaks unattended creates mold that can seriously affect your health. Moisture also rots any wooden framework and can cause a structural collapse. 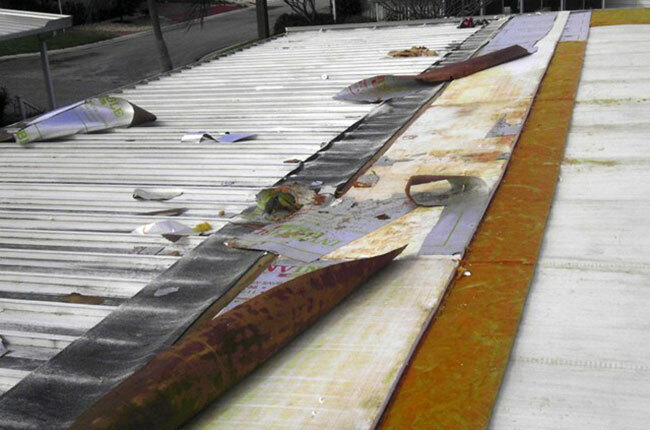 Before any of these issues cost you more in the long run, it’s probably better to save yourself the trouble and give All Weather Roofing a call. Our trained professionals will conduct a free video inspection of the roof so you know where the problem lies and can give you a fair cost estimate for full replacement or repair. Before you head to the hardware store for some do-it-yourself patch kits, think about fixing the underlying problem once and for all. TPO is a synthetic rubber that is pliable and heat-sealed for leak-proof durability. Even under the most extreme weather conditions that can stir up Florida’s otherwise sunny disposition, the TPO will not crack. TPO is resistant to fire, pollutants, and is environmentally friendly. Unlike PVC, plasticizers do not wash away into the surrounding soil and there is no chlorine in the material. There are different widths to choose from to fit your budget and is considerably low cost when you consider how much longer TPO will with relatively low maintenance. Not only is TPO cost efficient in terms of labor and installation, but TPO’s unique reflectivity means you won’t be wasting your money cranking the A/C on full blast on a hot summer day. About 78% of the energy from the sun’s rays are reflected so your roof stays cool day in and day out. After you get your new and improved TPO roof, you will start to notice in your energy bills how energy efficient TPO reall is. Even if haven’t decided whether you really want to get a new roof installed, there’s no reason you can’t give All Weather Roofing a call to schedule your free, no-obligation video inspection. Our trained professionals will inspect your roof and show you the footage so you can see with your own eyes what needs to be addressed and how much it would cost. Sometimes, seeing really is believing. With video footage, you might just be willing to make a worthwhile investment. The best part of working with our mobile home roof replacement company is that you know you’re getting your money’s worth. With a lifetime warranty from All Weather Roofing on our TPO membrane installation, you can be sure that we never skimp on quality. For over 30 years, All Weather Roofing has been providing excellent service to Florida. Our customers rave about our professional and affordable service in reviews and the Better Business Bureau has rated us A+. If you’ve finally decided it’s about time for a new roof, then give us a call at 800-297-3758 or fill out a form online. We’re looking forward to your call!